The science of reproducing artificial limbs has gone on since the start of the earliest civilizations. Excavated proofs come in numbers to verify the suspicions of historians that man has always made the attempt to manufacture prosthetics even in its crudest ways. In fact, the need for artificial arms or legs is glorified in some popular and entertaining stories and legends. The easiest figure that comes to mind is the charming Captain Hook of the Peter Pan saga. Instead of a hand, attached to his arm is a shining and often evil-looking hook. Swashbuckling pirate shows often feature pirates with wooden pegs. Sci-fi movies take the idea to a whole new level with the RoboCop. 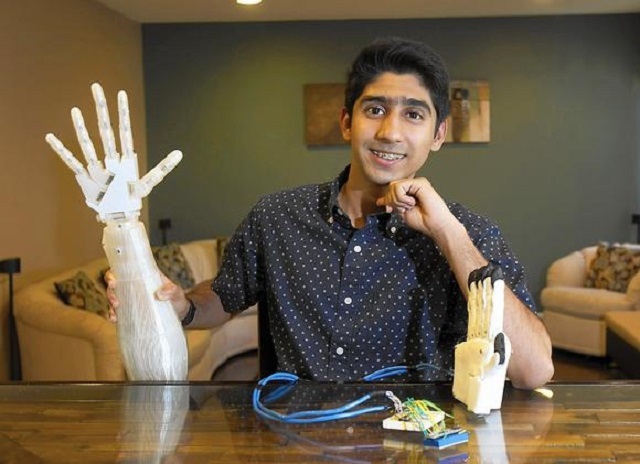 Taking prosthetics to a whole new level is the idea behind high school student Nilay Mehta’s invention. 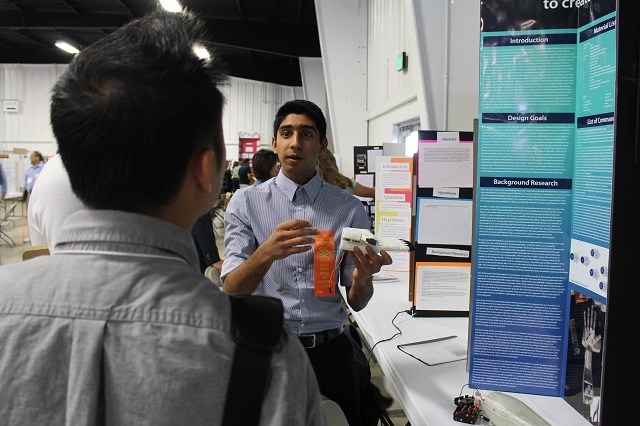 Amazingly, the right blend of 3D printed parts, several miniature motors, microphones, and some electrodes allowed him to create a voice controlled robotic arm. The robotic arm is immersed in electromyography technology and voice sensors to follow certain commands like grasp, pinch, and point among others. Apparently, the main difference is, instead of the brain, providing the orders, the user voices his commands for the arm to do some important and basic functions. Suddenly, RoboCop doesn’t seem as far fetched as previously believed. While some people would even prefer passive prosthetics, the kind that does not do much aside from enhancing the aesthetic appeal of the wearer, the robotic arm offers a “cool” look with the kind of indispensable functionality a prosthetic should possess. Instead of getting some awkward glances for some missing extremity, the user should get the kind of glances that goes with an open-mouthed amazement. The result of Nilay’s incredible ingenuity is the huge possibility of reducing the cost of prosthetics that are available to people. 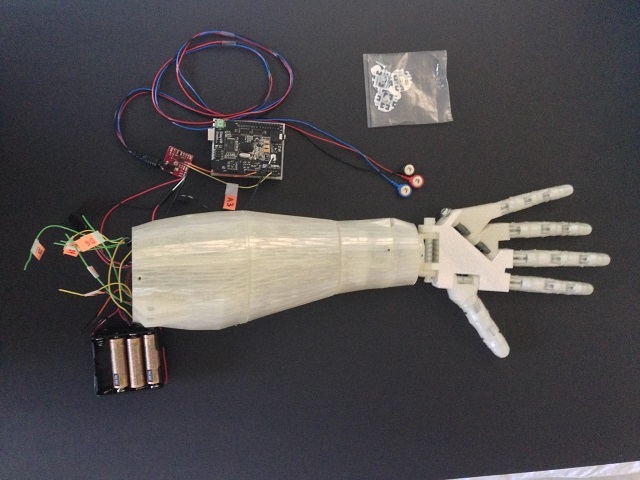 Currently, artificial limbs cost, well, an arm and a leg. With the use of 3D printing, material cost will be significantly reduced. Whether the 3D printing is done through SLS or FDM, since these are most commonly used for 3D printing, it will definitely be more affordable. The low cost option without sacrificing durability and quality would also be a solid alternative for people in need of prosthetics. Cost reduction is luckily not the only thing the high school wonder kid had in mind. The ability to upgrade the prosthetics to suit the specific age of the user is another fantastic idea. Since young people amazingly grow fast, they need to upgrade their artificial limb both for aesthetic and functional sense. And again, cost comes into play with every change. 3D printing being a major factor in the material used, resizing should happen without breaking the bank. Since the invention has garnered several awards already, it should be no surprise that in the near future, the prototype should be tested for use by an amputee. There is just too much promise with the invention, even, at this stage, for it not to be taken seriously. 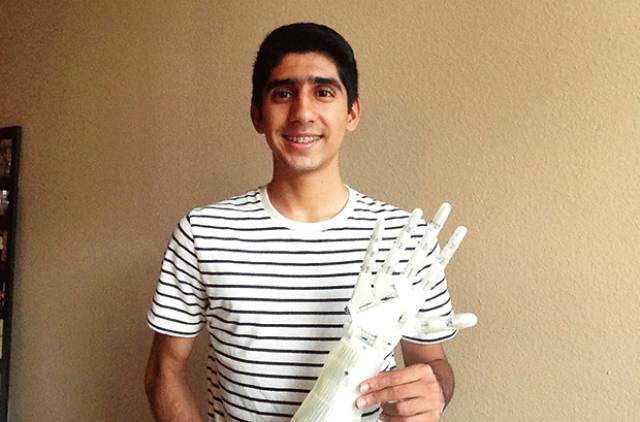 Hopefully, the future will arrive soon enough for people in need of prosthetics.